This paper wes published in J. Mater. Chem. A, 2014. Recently, there has been rapid growth in research related to the synthesis and application of flame retardant polymer–layered double hydroxide (LDH) nanocomposites. In order to outline the potential and to promote further developments in the field we have prepared a critical review of the most recent progress in the area. We discuss the techniques and indices (e.g. micro calorimetery, limiting oxygen index, cone calorimetry and UL-94) for evaluating the flame retardant properties. The flame retardant mechanism of LDHs, the types of polymers studied, the effect of LDH chemical composition and the synergistic effect with other fire retardants are reviewed. It is hoped that this review will not only introduce the synthesis, characterisation and application of polymer–LDH nanocomposites for flame retardancy, but also prompt new discussion on the use of LDH dispersions in polymer-based materials. 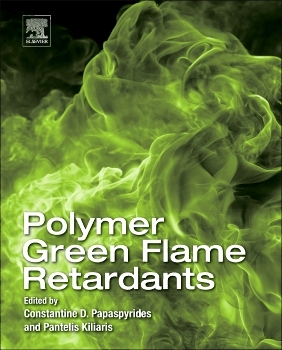 Polymer Green Flame Retardants covers key issues regarding the response of polymers during fire, the mechanisms of their flame retardation, the regulations imposed on their use, and the health hazards arising from their combustion. Presenting the latest research developments, the book focuses in particular on nanocomposites, believed to be the most promising approach for producing physically superior materials with low flammability and ecological impact. The fire properties of nanocomposites of various matrixes and fillers are discussed, the toxicological characteristics of these materials are analyzed, addressing also their environmental sustainability. Edited by distinguished scientists, including an array of international industry and academia experts, this book will appeal to chemical, mechanical, environmental, material and process engineers, upper-level undergraduate and graduate students in these disciplines, and generally to researchers developing commercially attractive and environmentally friendly fire-proof products.